Paramedics were called to the singer's Beverly Hills home at about midday on Thursday after he stopped breathing. He was pronounced dead two hours later at the UCLA medical centre. 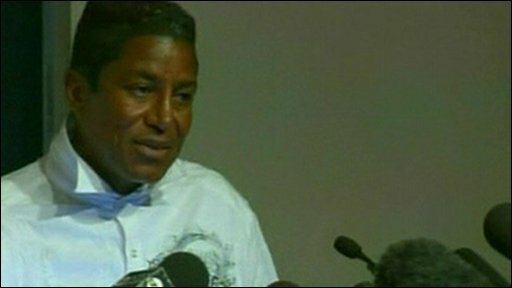 Jackson's brother, Jermaine, said he was believed to have suffered a cardiac arrest. He added: "The family request that the media please respect our privacy during this tough time." "And Allah be with you Michael, always. I love you." TV footage showed the star's body flown from UCLA to the LA County Coroner's office where a post-mortem is expected to take place on Friday. Concerns were raised last month when four of Jackson's planned comeback concerts were postponed, but organisers insisted the dates had been moved due to the complexity of staging the show. 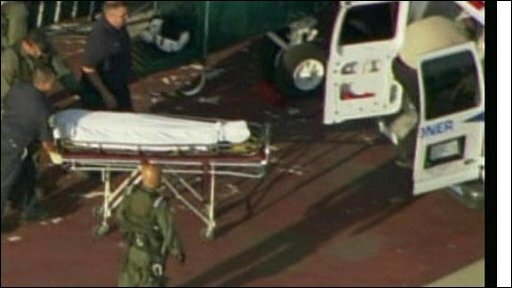 Michael Jackson was brought here to the UCLA Medical Center in Los Angeles around 12 hours ago. Earlier there were several hundred people here, before it got dark - there was a sense of grief, of disbelief. This has turned into an impromptu celebration of Michael Jackson's music. He's the king of pop as far as they're concerned. They're still shocked by his sudden death but they're here because they want to show their support. Broadcaster Paul Gambaccini said: "I always doubted that he would have been able to go through that schedule, those concerts. It seemed to be too much of a demand on the unhealthy body of a 50 year old. "I'm wondering that, as we find out details of his death, if perhaps the stress of preparing for those dates was a factor in his collapse. "It was wishful thinking that, at this stage of his life, he could be Michael Jackson again." Tributes have poured in from the entertainment industry. Sir Paul McCartney described Jackson's death as " sad and shocking". The pair worked together on two hit tracks, Say Say, Say and The Girl Is Mine from Jackson's Thriller album. 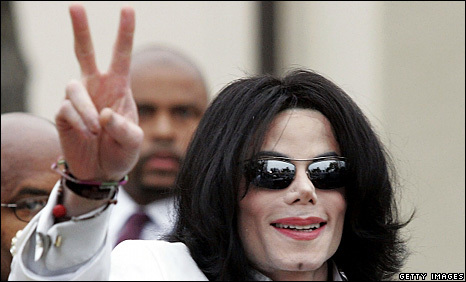 He said " I feel privileged to have hung out and worked with Michael. He was a massively talented boy-man with a gentle soul. "His music will be remembered forever and my memories of our time together will be happy ones. "I send my deepest sympathy to his mother and the whole family, and to his countless fans all around the world." Speaking outside New York's historic Apollo theatre, civil rights activist Rev Al Sharpton paid tribute to his friend. "I knew him 35 years. When he had problems he would call me," he said. Can't believe it. I'm gutted. RIP Michael, thanks for everything you gave us. "I feel like he was not treated fairly. I hope history will be more kind to him than some of the contemporary media." Melanie Bromley, west coast bureau chief of Us Weekly magazine, told the BBC the scene in Los Angeles was one of "pandemonium". "At the moment there is a period of disbelief. He was renting a home in the Holmby Hills area of Los Angeles and the scene outside the house is one of fans, reporters and TV cameras - it's absolute craziness. "I feel this is the biggest celebrity story in a long time and has the potential to be the Princess Diana of popular culture." Large numbers of fans have also gathered outside Jackson's home and at the UCLA medical centre with lit candles to mourn the star while playing his greatest hits. The singer's albums are occupying the top 15 slots of online music retailer Amazon.com's current best-seller chart, led by his 1982 smash hit Thriller. Paramedics were called to the singer's house in Bel Air at 1221 (1921GMT) following an emergency phone call. A spokesman for the Los Angeles Police Department said the robbery and homicide team was investigating Jackson's death because of its "high profile", but there was no suggestion of foul play. "He was the consummate entertainer and his contributions and legacy will be felt upon the world forever. I've lost my little brother today, and part of my soul has gone with him." 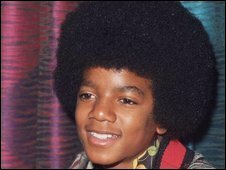 He is survived by his mother, Katherine, father, Joseph and eight siblings - including Janet, Randy, Jermaine and La Toya Jackson.